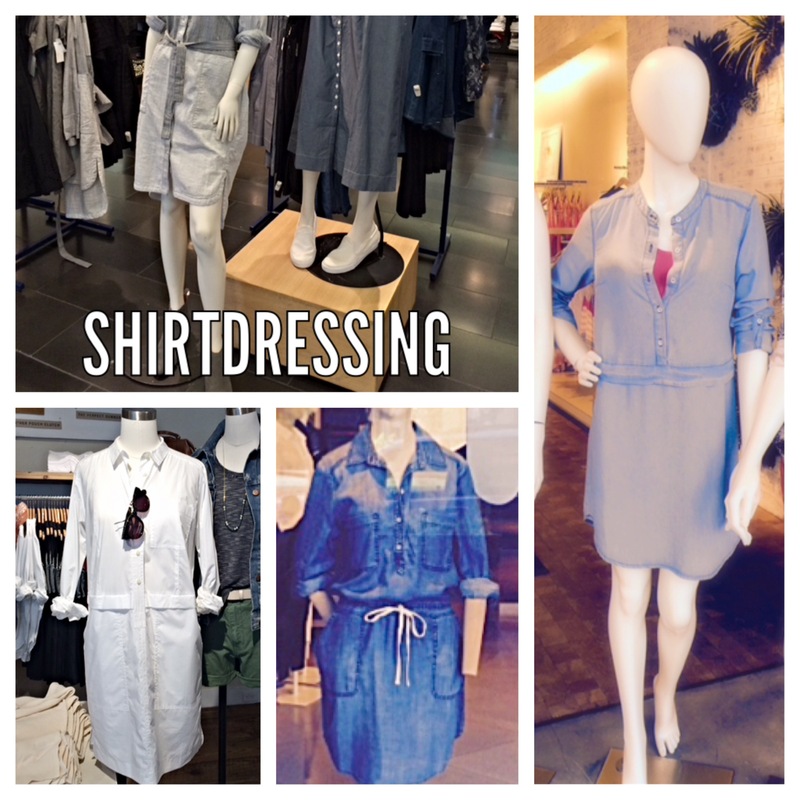 I am currently obsessed with the shirtdress! Take a look around the mall, every store currently has their own version of this easy-wear dress on display. 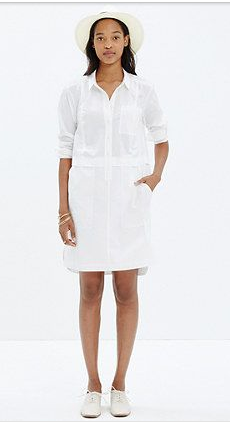 I love a shirt dress for it’s versatility. 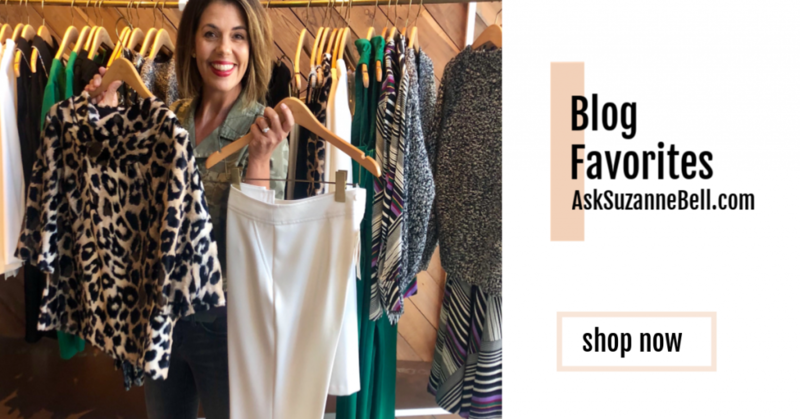 This number can be worn dressed up or down, layered with leggings or cropped skinnies, and if it fully buttons can be worn open as a topper -my kind of dressing! 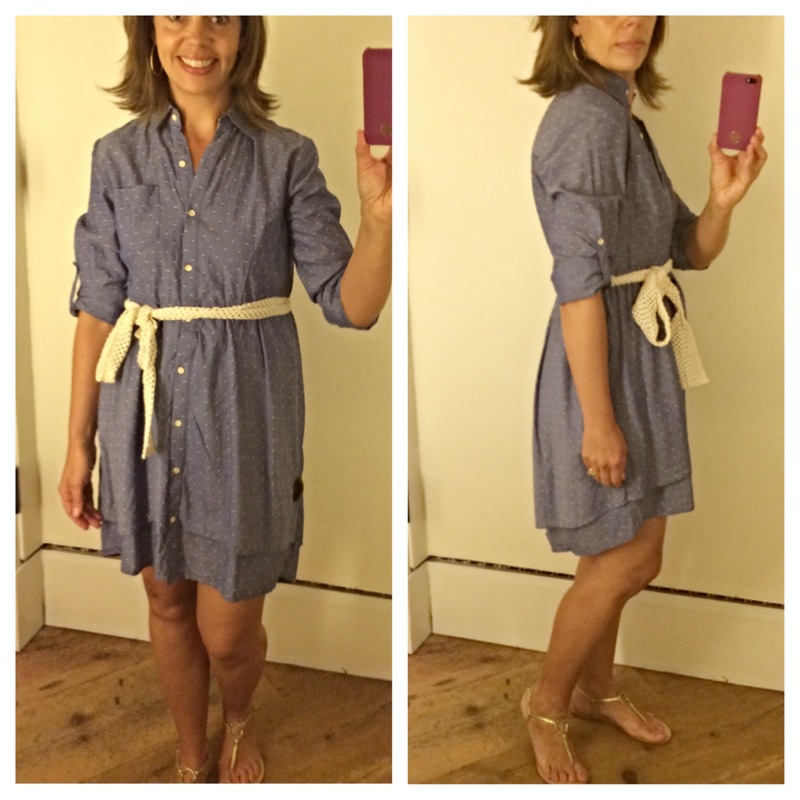 Getting a shirtdress to fit on me can be tricky as are shirts. The collar has to lay just right and I struggle to get a good fit in my shoulders. 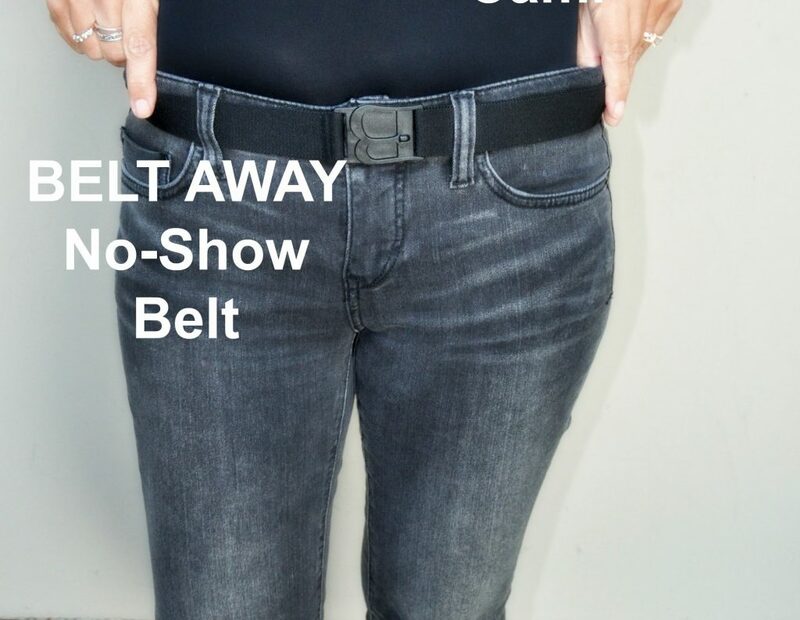 I am also short-waisted so the belt or tie often will find itself lying in the wrong spot. In search for the perfect one to fit my lifestyle, I did what any sensible online shopper would do and ordered all five to try on in the comfort of my home and make a decision on which one would be right for me. When I get my head around something I just have to get it out of my system-doesn’t everyone? All five arrived earlier this week so I am thrilled to be able to share my findings with you all and perhaps save you some time along the way. Here’s the round-up…you can thank me later! Ok so it’s not white or chambray but it was too cute to not include in the roundup! 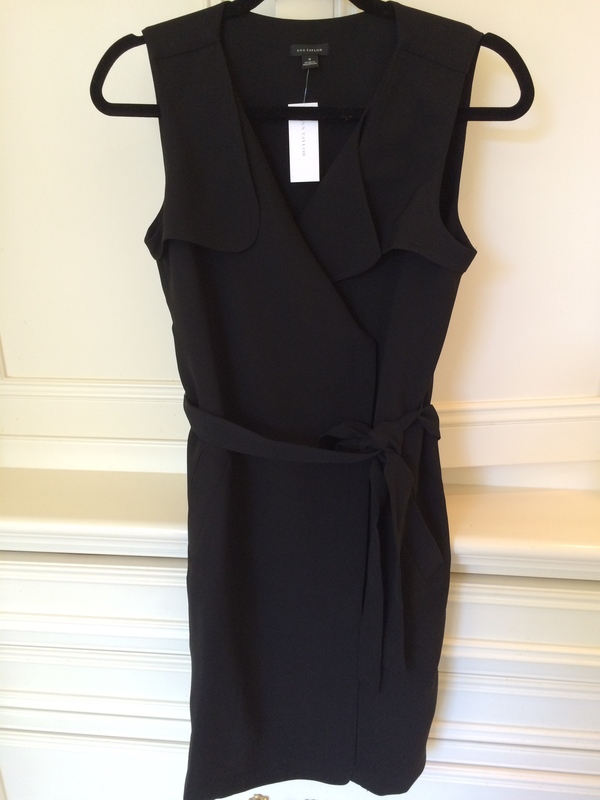 Out-of-the-box: First impression was whoa, this is a heavy dress. I’m not joking, it has some weight to it. Once I got over the weight issue, I liked the color and quality-it is a substantial dress! This looks like one I could dress up or down. Once on: This dress fit true to size, though if I were to keep it I would size up so it would look more like the model I also felt it was a tad short for my comfort level. This could be a good dress for petites. If I was petite or shorter I think it would be a great dress. Sleeves can be worn rolled or not. 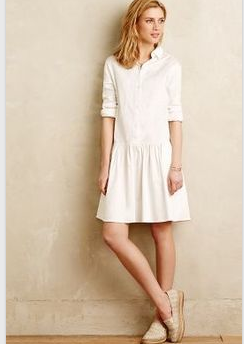 This would be a cute dress for work or play and is great quality. Out-of-the-box: First impression, this is darling! 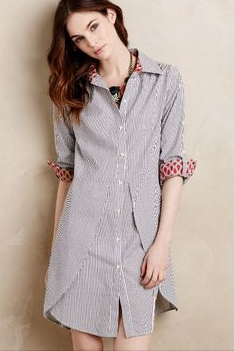 I love the stripe, the cute ticking in the neck and trim on the sleeve. 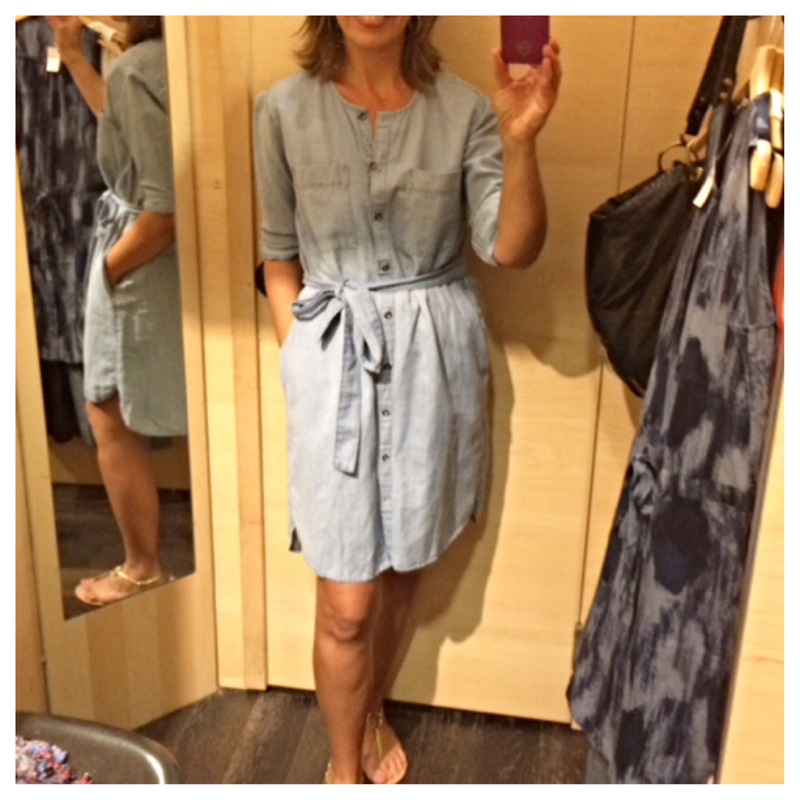 Very Anthro and light weight – bonus, it has pockets! I couldn’t wait to try this one on in hopes that I would like it on as much as I love it on the hanger! Once on: I really wanted this one to work as I loved all the details. Sadly for me, this could only be worn as a tunic or as a shirt jacket worn unbuttoned with denim and a tee. If I had a more defined waist I could see belting it for some shape but on me that only made it shorter. As you can see in the photo it doesn’t really have the tulip effect as in the photo either. Ran true to size. Take $50.00 off all full price dresses with code DRESSFORIT thru 3/30. See site for details! Out-of-the-box: Good quality dress. Straight out of the box it was not too wrinkled which I liked. I like that it is sleeveless. Once on: This dress is a keeper! Fit is true to size and quality is good. I felt that this dress fit my body type the best. 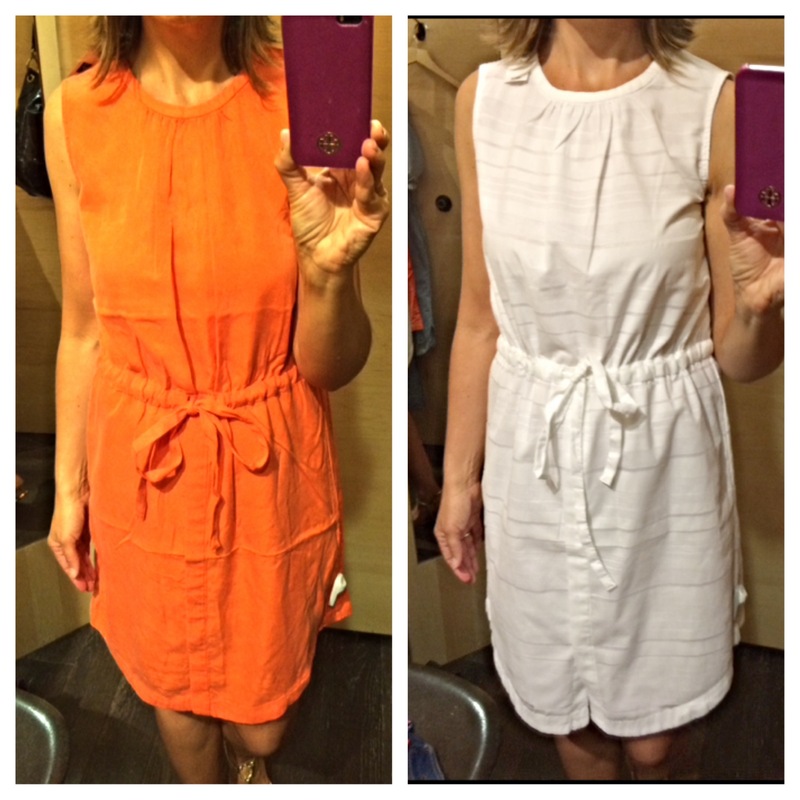 The other thing I really like about this dress as I can wear it alone with flat or heeled sandals- for work or play. I can also see wearing this with white pants or my black culottes-like a sleeveless long jacket. I see so many ways to wear this dress-which makes it a winner in my book! Out-of-the-box: Beautiful! The eyelet and quality of this dress is fantastic. This brand runs small for me so I ordered 2 sizes. Only the bottom in lined so we’ll see how that goes over. Once on: First off, I love this dress and on the right gal, this dress would be so FAB! I loved the quality and design of this dress. You do need to wear a tank under the top portion as it is unlined on top. For me, I could just not get it to lay right on my body type. Because my waist is high and not very defined the area where the tie sits could not figure out where to lie. I moved it around, adjusted it, tried two different sizes and just couldn’t get a good fit on me. This is a darling summer dress that can be worn open as a lightweight topper, as a dress or even over a swimsuit. Really cute on the right body type. Ran true to size. It kept moving around, it’s like I needed a longer torso. 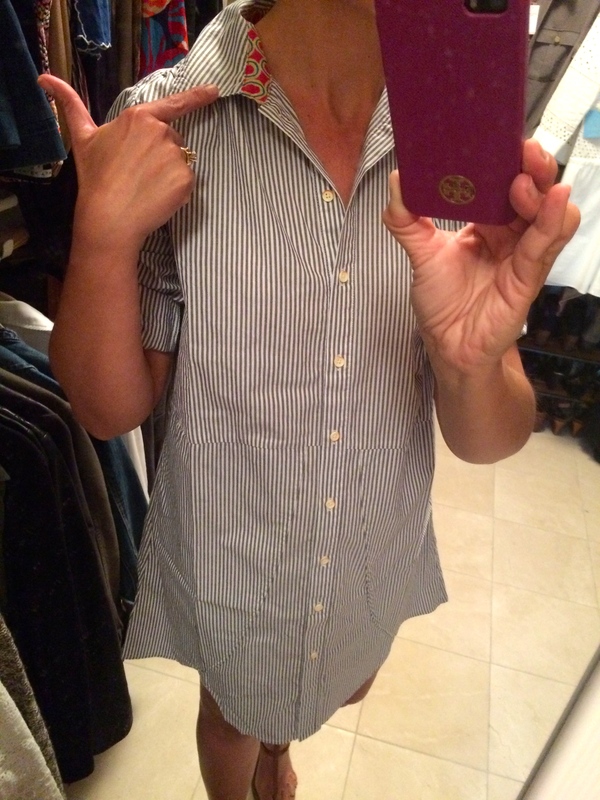 Out-of-the-box: It looks just like a shirt with the bottom half lined. Very minimalist. Once on: This dress would be adorable on the right body. I absolutely loved the look from the front. The side view for me was too full. I maybe could go down a size but then the shoulders may be too tight. If you love the look of a plain white shirt, this may be for you. It has really cute details in the back. 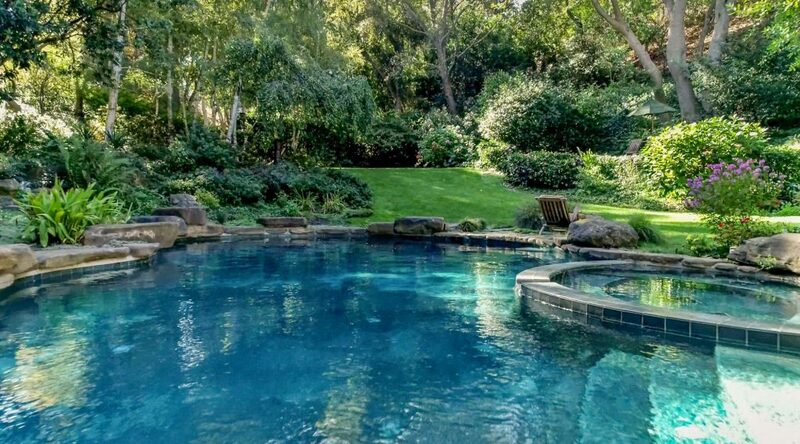 It is cool and lightweight, perfect for warm weather. As you can see, the top is a bit sheer so I would put a tank under it. On me, I felt like the dress was wearing me a bit if that makes sense. When I returned it to Madewell, I tried a size smaller on. All that did was make the dress fit tight in the hips. I can think of quite a few friends that this dress would be darling on with a pair of minimalist silver sandals. 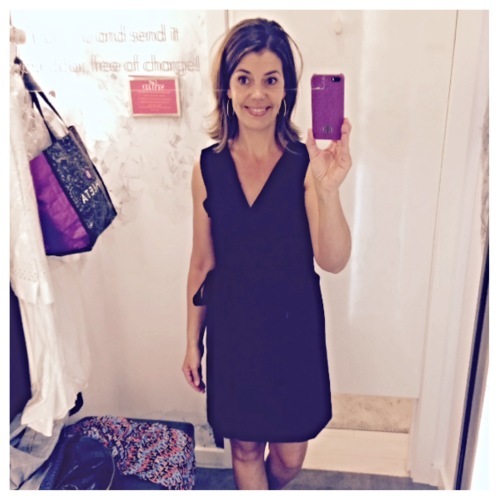 I am thrilled with my black sleeveless dress but am still on the lookout for a white, linen or chambray shirtdress for summer. 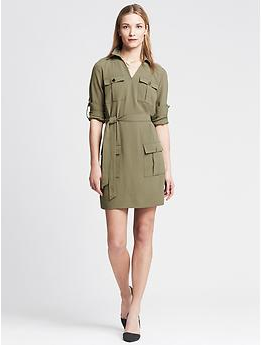 I came across this one by Ralph Lauren on Nordstrom.com and will be giving it a try-stay tuned! 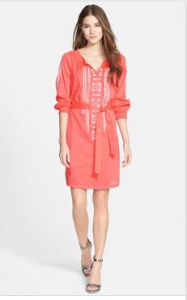 I have not tried this Caslon dress on but have seen it in person (they only had one left in the store in an XL) and I think it is a great boho feeling shirtdress. The coral color is as shown and the white and black are also very pretty. It is lightweight and lined. You may recognize this dress as I believe it is a knock off of the Velvet by Graham and Spencer from Anthropologie last Spring. 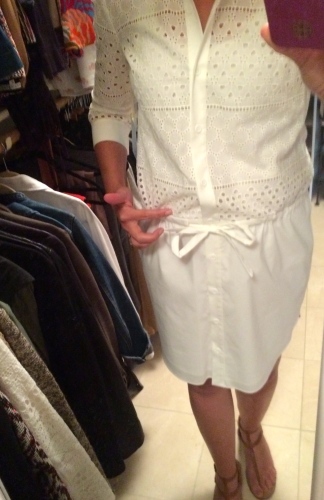 This is my girlfriend’s actual dress from Anthro and it is really cute on! May be worth a peek., as the Caslon version is a 1/3 of the price of the one from Velvet. This can be worn dressed up or down as well as over a swimsuit on vacation! On me you can see it cuts me right in half, not a great look from the front. I would imagine this dress would be really flattering on someone who is not shortwaisted. Hourglass ladies, this is your dress- show off that waist of yours! You may not be able to tell in the photo but it has little pin dots on the fabric. I felt it was short on me as well so that is great news for many! When I was at the mall returning my rejects, Gap drew me in with their fun window displays. 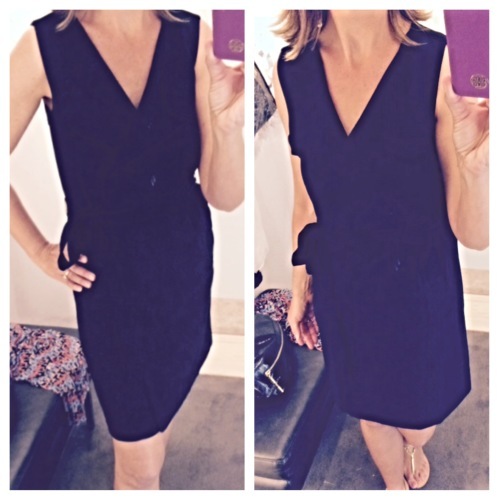 This dress fit true to size and came in 4 colors. The white has a texture to it and is also available in navy blue. Runs big! This is a small and I for sure needed an XS. The belt makes it all adjustable but the small was just way too big. What do you think? Are you going to give this trend a try? As you can see there is something for everyone, you just need to find what works for your body type and lifestyle! This is just the tip of the iceberg for what is available for this style this spring season – more to come! Let me know your thoughts, comments down below! Enjoy this beautiful weekend and thanks for following along! 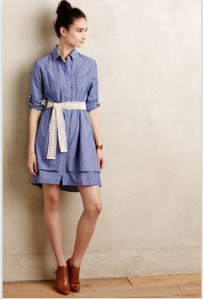 You make the shirt dress look even more fabulous! I especially love the lower bottom at back. And I love how you have paired it with a summer hat!